//	Sony H4493 Geekbench Listing Confirms SD660, 6 GB RAM; Could it be Sony Xperia XA3? Sony H4493 Geekbench Listing Confirms SD660, 6 GB RAM; Could it be Sony Xperia XA3? Sony Xperia XA3 was spotted on the website of Eurasian Economic Commission (EEC) last month and it was also certified by TENAA authority in China. These listings show that the model number of Xperia XA3 is H4413. It is speculated that model numbers like H4433 and H4493 also belong to the same smartphone. Today, the Sony H4493 has surfaced on Geekbench to confirm some of its key specs. 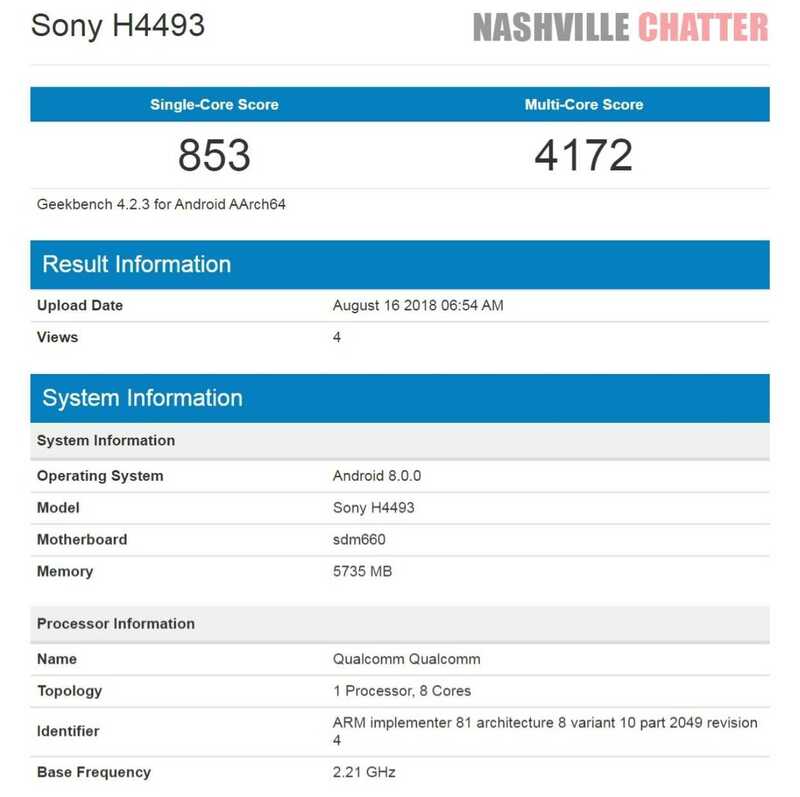 The Geekbench listing of the Sony H4493 has revealed that it is fueled by Snapdragon 660 SoC and 6 GB of RAM. And, it is loaded with Android 8.0 Oreo. Sony has never launched a smartphone with Snapdragon 660. Hence, the Xperia XA3 could be the first phone from the company to arrive with SD660. It is expected to arrive as the successor of Snapdragon 630 powered Xperia XA2 that was unveiled in January this year. Also Read: Sony H8416 Smartphone Spotted on GFXBench with Flagship Specs; Could it be Xperia XZ3? The TENAA listing of the Sony H4413 is yet to be populated with full specs. Its UAProf appearance have confirmed that it is equipped with Full HD+ resolution supporting display. There is no information available on the other specifications of the Xperia XA3. Sony has confirmed that it will be holding a press event at the upcoming IFA 2018 tech expo in Berlin, Germany. Rumors have it that Sony will be debuting the Xperia XZ3 phone with dual rear cameras. There is a possibility that the mid-range Xperia XA3 may also get announced at the same event.